Suffering a burn injury is immensely painful and entails a long recovery process; it is an ordeal that is never underestimated at Parr Richey Frandsen Patterson Kruse LLP. We treat victims of burn injuries with the attention, seriousness and compassionate attitude that they deserve. If you have sustained catastrophic burn injuries after an accident, speak immediately with an Indianapolis personal injury lawyer at our firm. Our dedicated personal injury attorneys Paul Kruse and Tony Patterson have been recognized for their numerous verdicts and settlements on behalf of clients who have sustained catastrophic damages. Both Attorney Kruse and Attorney Patterson have been recognized for their consistent trial success. In fact, Attorney Patterson has been honored with inclusion in the Million Dollar Advocates Forum®, which is limited to less than 1% of practicing trial attorneys who have secured million-dollar settlements. Have you survived a burn injury accident? Burn injuries can come from a variety of causes, but the damage remains the same across the board. Anyone who sustains a serious burn injury could face life altering and permanent damages. Burn injury survivors will typically experience some of the most painful and horrific injuries that a person could possibly experience in a lifetime. While a burn victim can typically survive an accident that caused the injury, they must live with the life-altering repercussions. If you or a loved one has recently been a burn victim, you must seek the legal help that you need at this time. 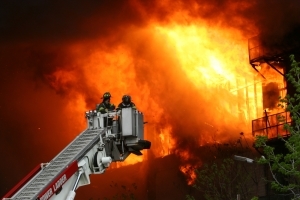 Only a skilled Indianapolis burn injury attorney can evaluate your case. We completely understand the pain your burn injury has caused you and we are dedicated to seeking the financial and legal action that you need! At Parr Richey Frandsen Patterson Kruse LLP, our skilled trial lawyers are ready to take on your legal matters! We prepare each case to the highest extent and we are never afraid to go to trial to secure the best possible resolution for you. We have more than 75 years of combined legal experience and we have successfully represented countless catastrophic injury claims. Don't live the rest of your life paying for something that was wrongfully committed against you. We have represented thousands of clients in the past, and we have secured millions for injured victims throughout Indianapolis and Lebanon. To pursue a successful outcome, we utilize our extensive knowledge of the law, the courts, and the insurance companies to hold negligent parties responsible. Contact Parr Richey Frandsen Patterson Kruse LLP to schedule your case evaluation. If we take on your case, we can help pursue compensation that will put you in the best possible position to recover. Start enjoying your life again and call us today; our phone lines are open 24/7!